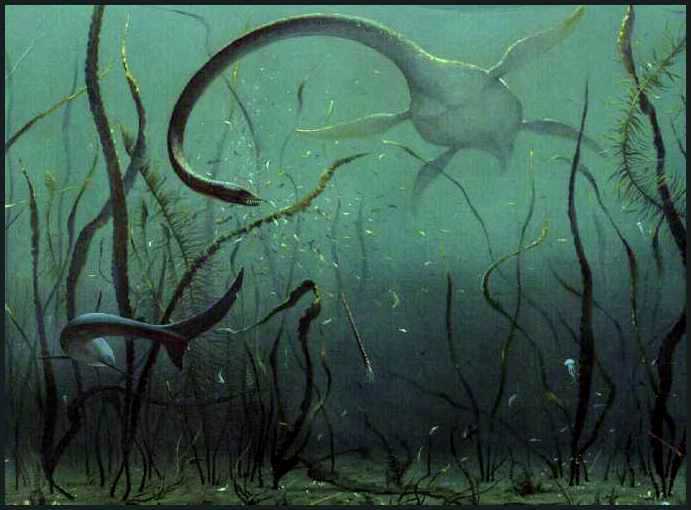 "Painting by Vladimir Krb, courtesy of the Royal Tyrrell Museum of Palaeontology"
On April 23, 1992, we returned to the Logan County plesiosaur site in hopes of completing the dig on the large Alzadasaurus found by Pete Bussen. In 1991, we had uncovered most of the animal behind the shoulders and thought we had the specimen pretty well figured out. 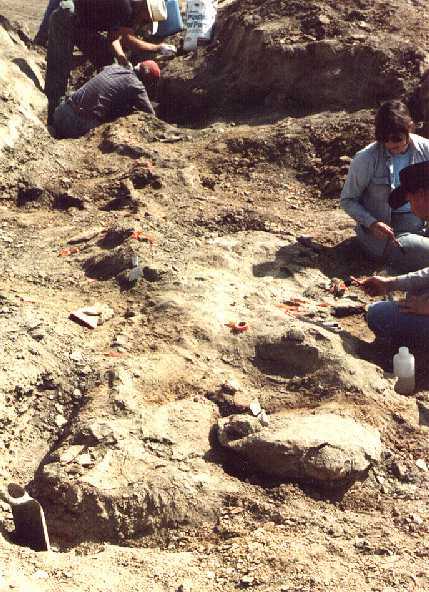 Paleontology is full of interesting surprises, however, and one of the first that we found was that there was another "left rear paddle" near where we had removed the "left rear paddle" in 1991. Apparently the plesiosaur had come to rest on it's left side and both rear paddles were preserved next to each other, at slightly different levels. This photo (CLICK TO ENLARGE)is a view of the remains from where I was standing behind the hips to the area where the neck was being uncovered. 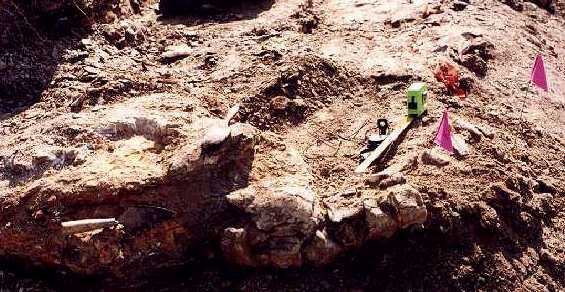 The large 'lumps' in the center are the concretions that enclosed most of the dorsal vertebrae. A slightly larger view of the main portion of the plesiosaurs body. 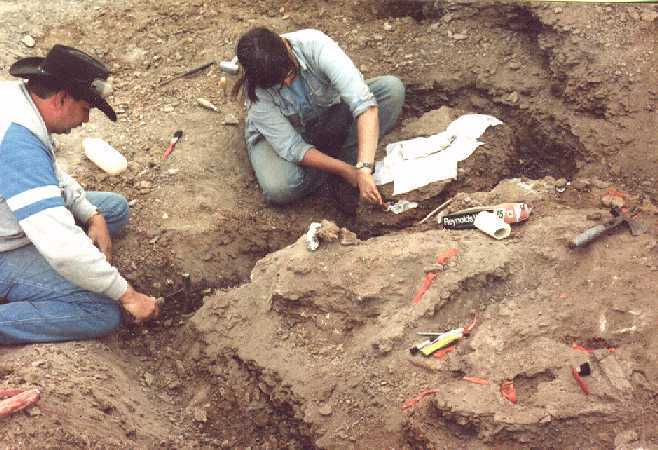 Barbara Grandstaff is directing work on clearing away shale and debris from the ribs while David Parris (top) is working on uncovering vertebrae from the plesiosaur's long, but still articulated neck. This photo shows the base of the neck, just above where the upper limbs would have been. The neck in most elasmosaurs is about as long as the body and is composed of many relatively short, but tightly-interlocked cervical vertebrae. It is unlikely that these animals could twist their necks into the various contortions shown in many illustrations. Barbara's hand rests on the "other left rear paddle" found just to the east of where we had removed a complete paddle in 1991. Some paddle bones are visible to the left of the gloved hand in the center of the picture. Barbara begins the process of jacketing the plesiosaur paddle for removal. Dampened tissue paper and paper towels are pressed against the exposed bone to protect and cushion the material when the jacket is rolled over, and for the long trip back to it's new home in New Jersey. Ken works on the middle of the long neck of the plesiosaur. 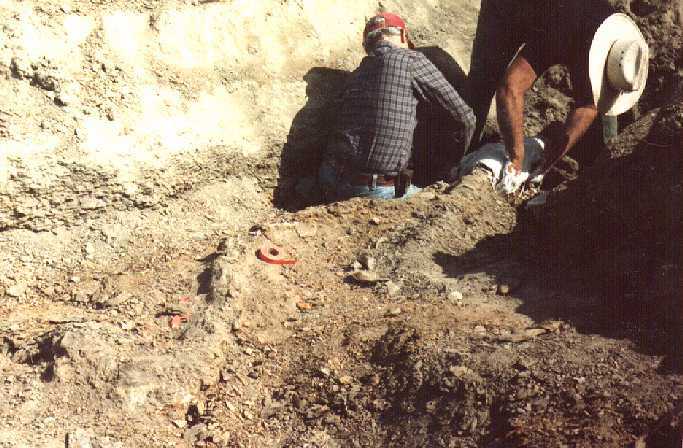 The remains of the body are to the left of the photo. In spite of it's length, the neck was relatively inflexible and was held straight out in front of the plesiosaur as it swam. End of the line..... Finis!...... It's all over...... The saddest moment of the dig was when we got to the end of a 20 foot long string of cervical vertebrae and found that the skull had already eroded out of the shale, probably thousands of years earlier. 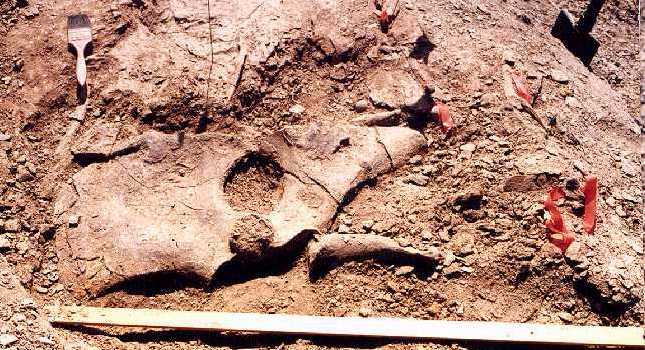 The last several vertebrae had also slid downward before being covered with wind blown soil. Plesiosaur skulls are very rare as fossils to begin with because of their relatively small size and light construction, so we were hoping that we'd manage to come up with one. 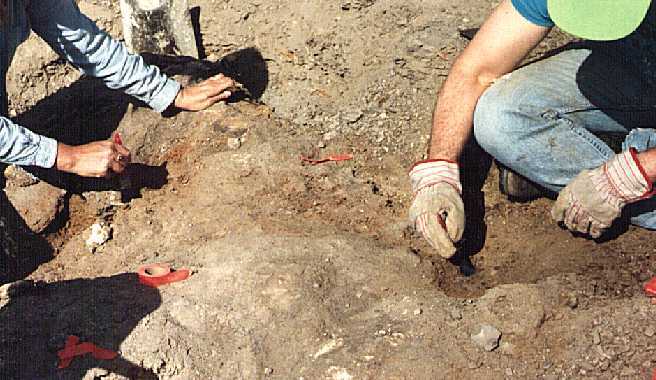 To dig for several days toward the head end of this plesiosaur, and then find that the skull was missing, was very disappointing. EPILOG: Although the remains were all uncovered in April, 1992, there was simply not enough space available in the New Jersey Museum field crew's vehicles to carry it all back with them. The site was tarped and covered, and the crew returned on August 22, 1992, to pick up the rest of the Alzadasaurus. Not content just to find one Alzadasaurus, our friend Pete Bussen located another in early 1995, and again asked David Parris if he was interested. Of course, the answer was "yes", and the second dig started in August of 1995. The two pictures shown below come from the first day of that dig. 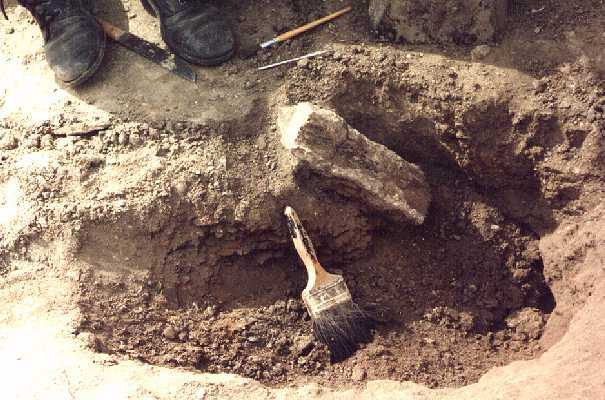 After a three year delay, the dig was completed by the Cincinnati Museum in 1999. 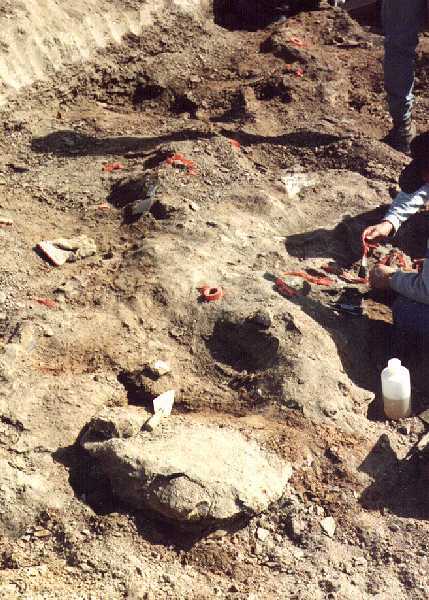 The plesiosaur's caudal vertebrae (visible at the lower edge of the picture) were found eroding out of a hillside. Some had already been lost to weathering by the time the remains were found. The concretion at the lower left also contains several vertebrae. Someone with a paint brush is cleaning up the area where we found stomach contents and gastroliths. On the first day of the dig, we cleared off a lot overburden off the site and the animal appeared to be going head first into the hillside. This is half of the plesiosaur's pelvis (hips). 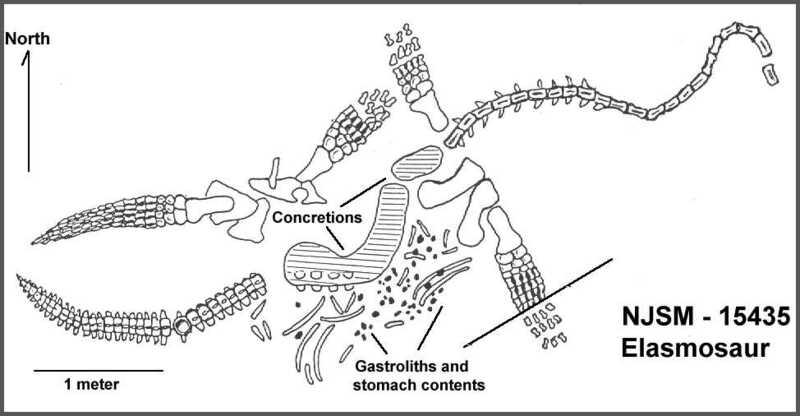 In plesiosaurs, the shape of pelvis has a number of distinguishing characters and David Parris was able to identify the plesiosaur as a probable Alzadasaurus from these bones.